Is it possible to print the dialog program / module pool program screen? I have created module pool program screen with some fields.I want to print that screen. Is it possible to convert module pool screen to PDF or spool to take print out? Note: I have used "submit and return" statement, but it is not giving spool (Went to cancel status). Could you please explain the context of your requirement? Because you could use a non-SAP screenshot free software, but I think it's not what you're asking for. Do you want to use that for user support so that users can easily send screenshots, or things like that? (cf https://blogs.sap.com/2016/02/18/encode-data-into-an-png-image-file/) Or is it for something else? I want to print the total screen, Example : I have created screen like blow. I want print this total screen itself (print as it is, like smart form print). How to print? What Max means is: create a smartform and populate fields from the data on your screen. Try using the class CL_GUI_FRONTEND_SERVICES, there is a method in it called GET_SCREENSHOT. On the other hand, if all you are looking for is a way for end-users to print a screen shot, you can have the users go to the last icon on the toolbar and select Hard Copy from it. This is SAPGui for Windows function and is not available to trigger from ABAP. On the Java GUI go to the Main menu and select print from there. Requirement: Need a screen with editable and display option, If they will change the values, that need to store in database as well and they want take print out the same. So created module pool screen, added validation and logic as per requirement. this all are fine. But not able to take print out of that module pool screen. Not able to use CL_GUI_FRONTEND_SERVICES=>GET_SCREENSHOT because it is available in higher version only. Hard copy is fine but in hard copy also menu bar, tool bar and title all are coming in print. Can we ignore that tool bars? I don't think it's possible to print the screen, as some guys have said, you can do a screenshoot or an hardcopy. 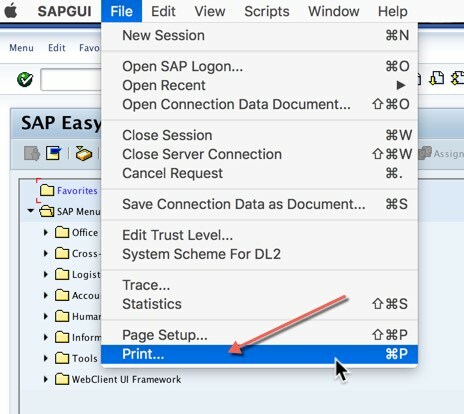 For you requirement, you would need to create a Smartforms or a Adobe Form (or SAPScript, if you still prefer) to generate the print out of the data. That's how any standard SAP transaction generates the Output. If you want to generate the output as soon as user saves the data, you can call the generate FM to display the output. As per My knowledge, Not possible, I had seen some posts, submit and return not possible for module pool. It is better Develop Smart form for module pool programming, , As per you need(which fields you need that fields). then Try for getting Spool Request.After submit button press.